1985: Degree in Biological Sciences,University of Pavia. 1993: PhD in "Cellular and Molecular Biotechnologies applied to Biomedicine", University of Brescia. 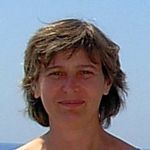 Since 1995: Assistant Professor in Applied Biology, Department of Biomedical Sciences and Biotechnology, University of Brescia. Since 2000: Faculty member of the PhD in Molecular Genetics applied to Biomedicine, University of Brescia. Mainly in the field of Human Molecular Genetics, with studies aimed to the identification and characterization of genes responsible for mendelian diseases, particularly genodermatoses and hereditary connective diseases (epidermolysis bullosa, Ehlers Danlos and arterial tortuosity syndromes). More recently the scientific interest has been focused on the study of schizophrenia and other brain diseases. The present main research lines are illustrated below. Schizophrenia is a severe debilitating disease with a lifetime risk in the general population of 0.5-1%. It is considered a multifactorial disease with a strong genetic component. However, despite the intensive worldwide efforts, the genetics of schizophrenia remains largely unknown. We have previously investigated the genetic factors predisposing to schizophrenia by case-control association studies and resequencing analysis of candidate genes. More recently we have implemented our research with genome-wide association studies and CNV analysis by mean of the Affymetrix microarray technology. This approach has led to the identification of large CNV, mainly deletions, in a few schizophrenia patients. Some of these CNV have been already reported in previous schizophrenia studies, whereas others are novel. Thus, the genes covered by these novel CNV represent new potential candidate genes in schizophrenia susceptibility. Expression and cellular studies are in progress in order to evaluate the function of these genes and their role in schizophrenia. If CNV are now accepted as convincing risk factors for schizophrenia their identification only in a small number of patients leaves the majority of the schizophrenia genetic variability unexplained. It is conceivable that, besides genomic structural variants, also rare point mutations might be causative or contribute to the schizophrenia phenotype, at least in a subgroup of patients. In this view we are planning the exome sequencing analysis of our patient sample. Hereditary ataxias are a group of heterogeneous neurological diseases characterized by the progressive loss of coordination of the movements, variably associated with extracerebellar symptoms, as well as peripheral neuropathy, spasticity, cognitive impairment, cardiomiopathies, etc. This clinical pattern derives from alteration in cerebellum and/or its connections with the central nervous system. Mutations in more than 30 genes have been reported in different forms of ataxia. The dominant forms are mainly due to dynamic mutations, whereas the recessive ones are more frequently due to point mutations. About 20% of ataxias exhibits almost exclusively cerebellar signs. These forms remain poorly characterized. By linkage analysis and exome sequencing approach we are searching for new causative genes in cerebellar ataxia families with unknown molecular defect. 1- Magri C, Sacchetti E, Traversa M, Valsecchi P, Gardella R, Bonvicini C, Minelli A, Gennarelli M, Barlati S (2010) New copy number variations in schizophrenia. Plos One,5,doi:10.1371. 2- Bonvicini C, Gennarelli M, Scassellati C, Bignotti S, Gardella R, Barlati S, Valsecchi P, Sacchetti E (2010) Polymorphic CA repeat in IGF-I gene: lack of association with schizophrenia. Psychiatr Genet, 20:44-45. 3- Iatropoulos P, Gardella R, Valsecchi P, Magri C, Ratti C, Podavini D, Rossi G, Gennarelli M, Sacchetti E, Barlati S (2009) Association study and mutational screening of SYNGR1 as a candidate susceptibility gene for schizophrenia. Psychiatr Genet, 19:237-243. 4- Magri C, Gardella R, Valsecchi P, Barlati SD, Guizzetti L, Imperadori L, Bonvicini C, Tura GB, Gennarelli M, Sacchetti E, Barlati S (2008) Study on GRIA2, GRIA3 and GRIA4 genes highlights a positive association between schizophrenia and GRIA3 in female patients. Am J Med Genet B Neuropsychiatr Genet, 147B:745-753. 5- Drera B, Guala A, Zoppi N, Gardella R, Franceschini P, Barlati S, Colombi M (2007) Two novel SLC2A10/GLUT10 mutations in a patient with arterial tortuosity syndrome. Am J Med Genet A, 143:216-218. 6- Magri C, Gardella R, Barlati SD, Valsecchi P, Sacchetti E, Barlati S (2007) M.tochondrial DNA haplogroups and age at onset of schizophrenia. Am J Med Genet B Neuropsychiatr Genet, 144B:496-501. 7- Coucke PJ, Willaert A, Wessels MW, Callewaert B, Zoppi N, De Backer J, Fox JE, Mancini GM, Kambouris M, Gardella R, Facchetti F, Willems PJ, Forsyth R, Dietz HC, Barlati S, Colombi M, Loeys B, De Paepe A (2006). Mutations in the facilitative glucose transporter GLUT10 alter angiogenesis and cause arterial tortuosity syndrome. Nat Genet, 38:452-457. 8- Drera B, Castiglia D, Zoppi N, Gardella R, Tadini G, Floriddia G, De Luca N, Pedicelli C, Barlati S, Zambruno G, Colombi M (2006) Dystrophic epidermolysis bullosa pruriginosa in Italy: clinical and molecular characterization. Clin Genet, 70:339-347. 9- Magri C, Gardella R, Barlati SD, Podavini D, Iatropoulos P, Bonomi S, Valsecchi P, Sacchetti E, Barlati S (2006) Glutamate AMPA receptor subunit 1 gene (GRIA1) and DSM-IV-TR schizophrenia: a pilot case-control association study in an Italian sample. Am J Med Genet B Neuropsychiatr Genet, 141B:287-293.